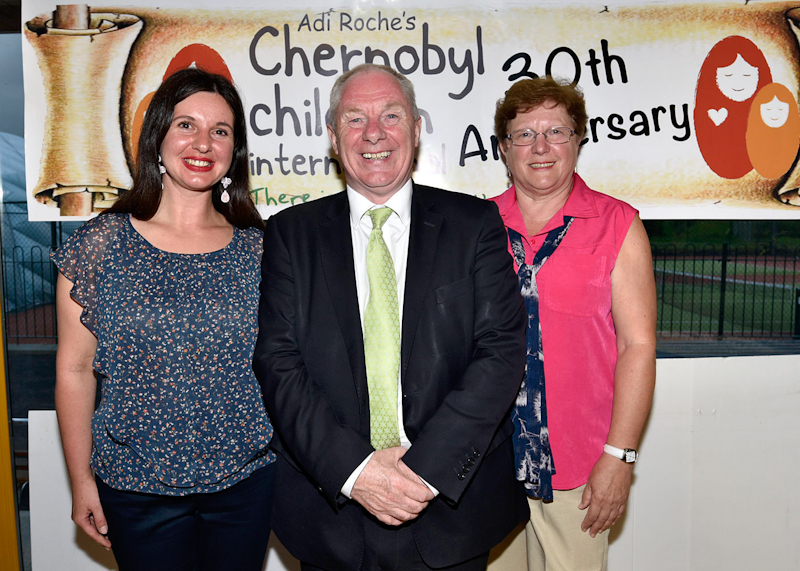 Chernobyl Children Castlebar Outreach group celebrations were held in Castlebar Tennis Club to mark the 30th anniversary, a group of teenagers from Belarus orphanage were the special guests on the evening along with past and present host families. Part of the group are staying in Lough Lannagh with their interpreters and carers, l-r; Brendan Chambers, Aishling Murphy, Olga Salanuyova and Marie Cox. Photo © Ken Wright Photography 2016. 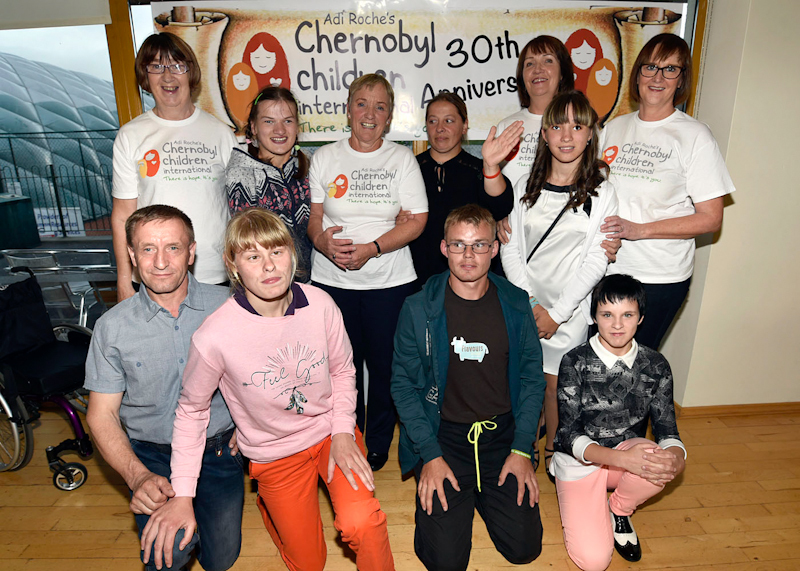 Chernobyl Children Castlebar Outreach group celebrations were held in Castlebar Tennis Club to mark the 30th anniversary, a group of teenagers from Belarus orphanage were the special guests on the evening along with past and present host families. Part of the group are staying in Lough Lannagh with their interpreters and carers, front l-r; Sasha, Nina, Sasha and Anya. 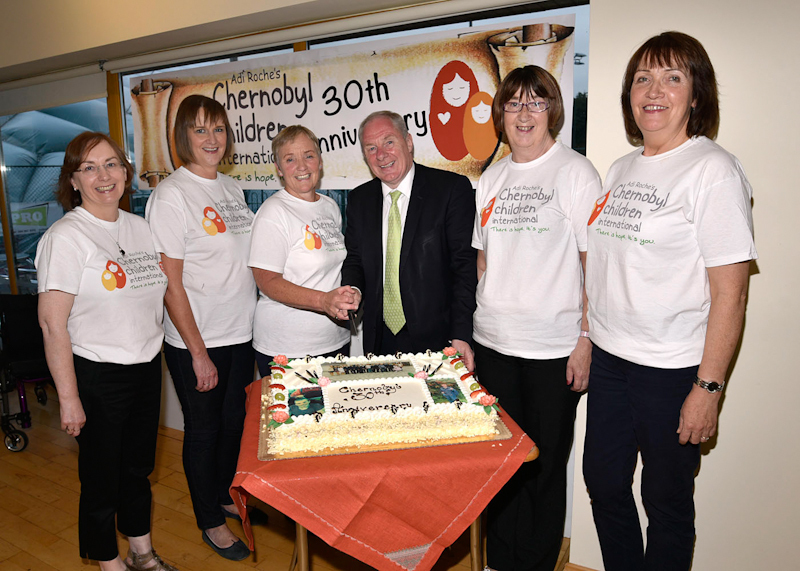 Back l-r; Bernie Boyle, Vera, Ann Coleman, Chairperson, Sveta, Mary McCusker, Olga and Marie Cox. Photo © Ken Wright Photography 2016. 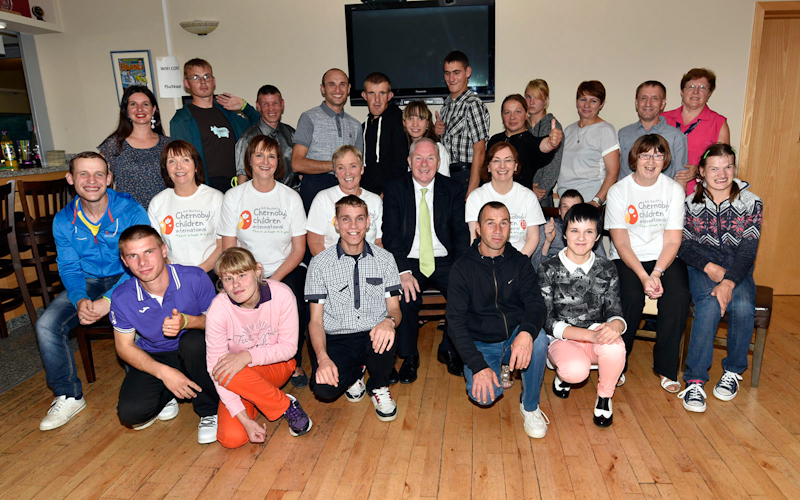 Chernobyl Children Castlebar Outreach group celebrations were held in Castlebar Tennis Club to mark the 30th anniversary, a group of teenagers from Belarus orphanage were the special guests on the evening along with past and present host families, interpreters and carers and special guest Minister of State for Regional Economic Development Michael Ring TD. Ann Coleman, Chairperson cutting the celebratory cake with the help of Minister of State for Regional Economic Development Michael Ring TD, l-r; Julie Chambers, Marie Cox, Ann Coleman, Michael Ring TD, Bernie Boyle and Mary McCusker Photo © Ken Wright Photography 2016. 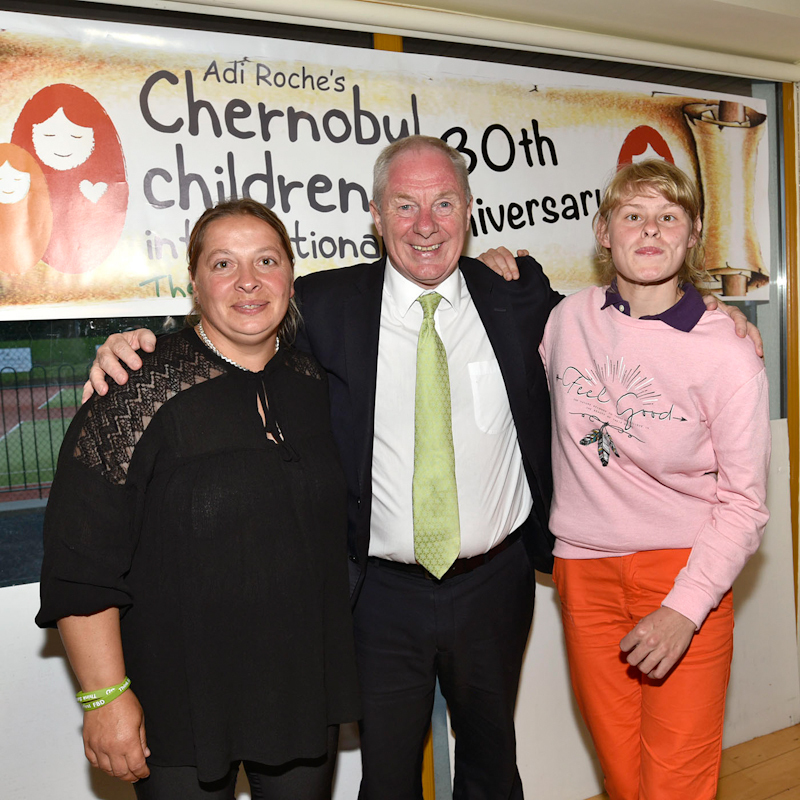 Chernobyl Children Castlebar Outreach group celebrations were held in Castlebar Tennis Club to mark the 30th anniversary, a group of teenagers from Belarus orphanage were the special guests on the evening along with past and present host families, Minister of State for Regional Economic Development Michael Ring TD pictured with the two interpreters Natallia Leiser and Victoria Chalahayiva. Photo © Ken Wright Photography 2016. Chernobyl Children Castlebar Outreach group celebrations were held in Castlebar Tennis Club to mark the 30th anniversary, pictured are the committee members, Mary McCusker, Marie Cox, Ann Coleman, Chairperson, Julie Chambers and Bernie Boyle with a group of teenagers from Belarus orphanage who were the special guests on the evening with their interpreters and carers and special guest Minister of State for Regional Economic Development Michael Ring TD. Photo © Ken Wright Photography 2016. 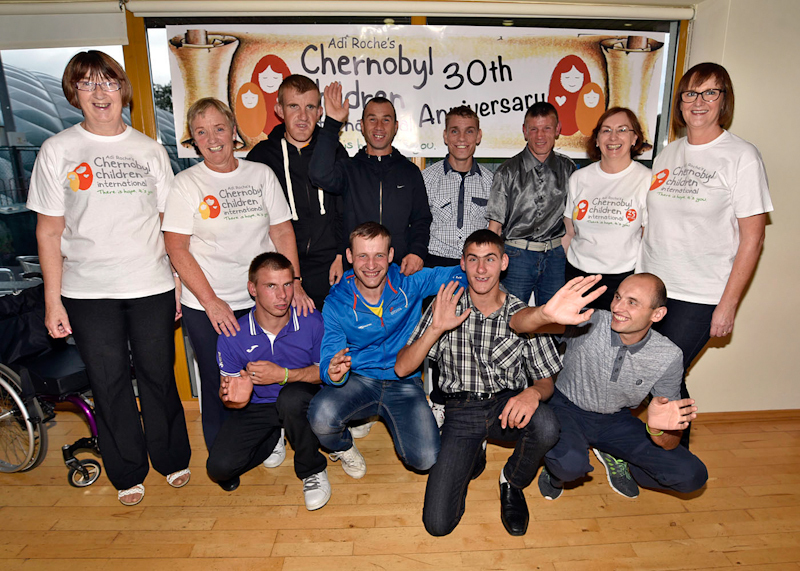 Chernobyl Children Castlebar Outreach group celebrations were held in Castlebar Tennis Club to mark the 30th anniversary, a group of teenagers from Belarus orphanage were the special guests on the evening along with past and present host families. Part of the group are staying in Lough Lannagh with their interpreters and carers, front l-r; Micha, Slava, Vasa and Micha, back l-r; Bernie Boyle, Ann Coleman, Chairperson, Vova, Koyla, Micha, Ivan, Julie Chambers and Marie Cox. Photo © Ken Wright Photography 2016. 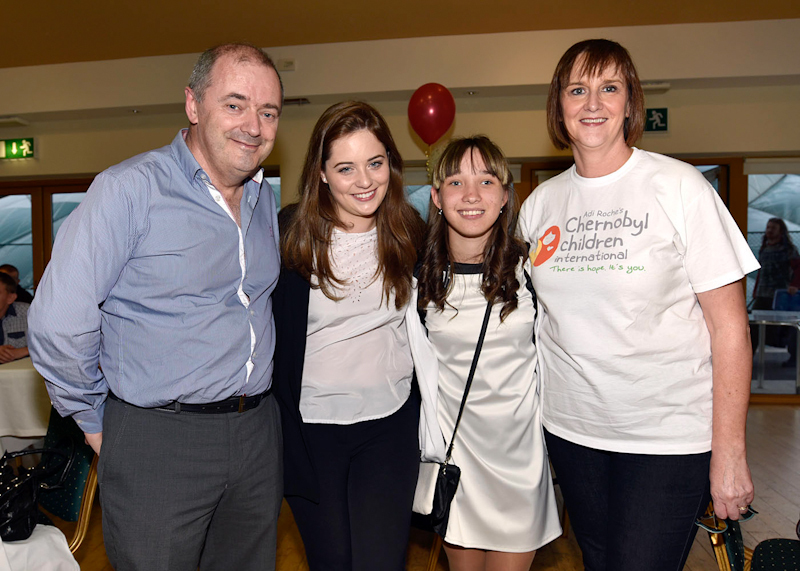 Chernobyl Children Castlebar Outreach group celebrations were held in Castlebar Tennis Club to mark the 30th anniversary, a group of teenagers from Belarus orphanage were the special guests on the evening along with past and present host families, Minister of State for Regional Economic Development Michael Ring TD pictured with two of the teenagers Sveta and Nina. Photo © Ken Wright Photography 2016. 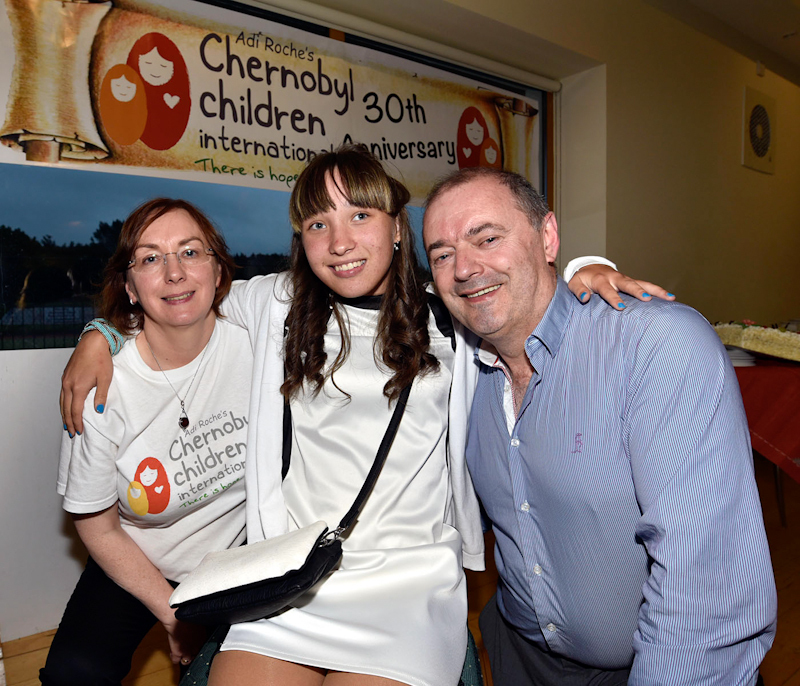 Chernobyl Children Castlebar Outreach group celebrations were held in Castlebar Tennis Club to mark the 30th anniversary, a group of teenagers from Belarus orphanage were the special guests on the evening, host family Julie and Brendan Chambers pictured with Olga . Photo © Ken Wright Photography 2016. 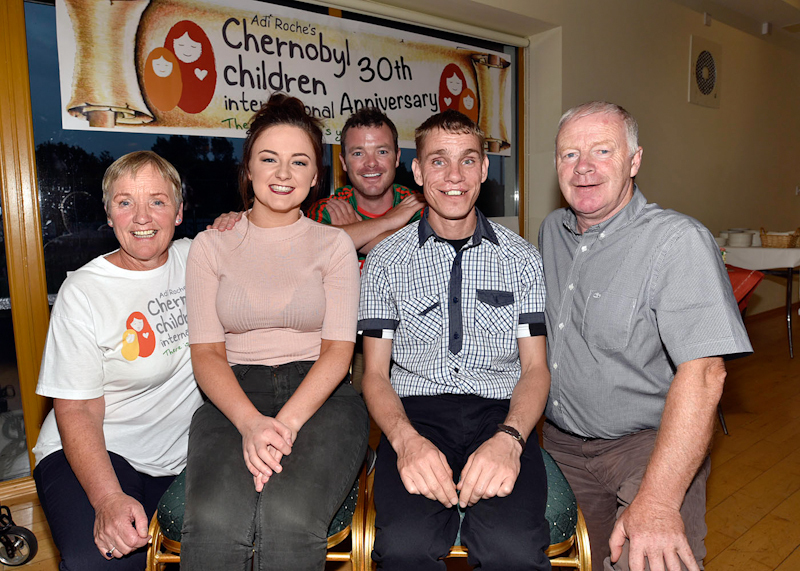 Chernobyl Children Castlebar Outreach group celebrations were held in Castlebar Tennis Club to mark the 30th anniversary, a group of teenagers from Belarus orphanage were the special guests on the evening, host family Ann, Jennifer, Brendan and Donie Coleman pictured with Micha. Photo © Ken Wright Photography 2016. 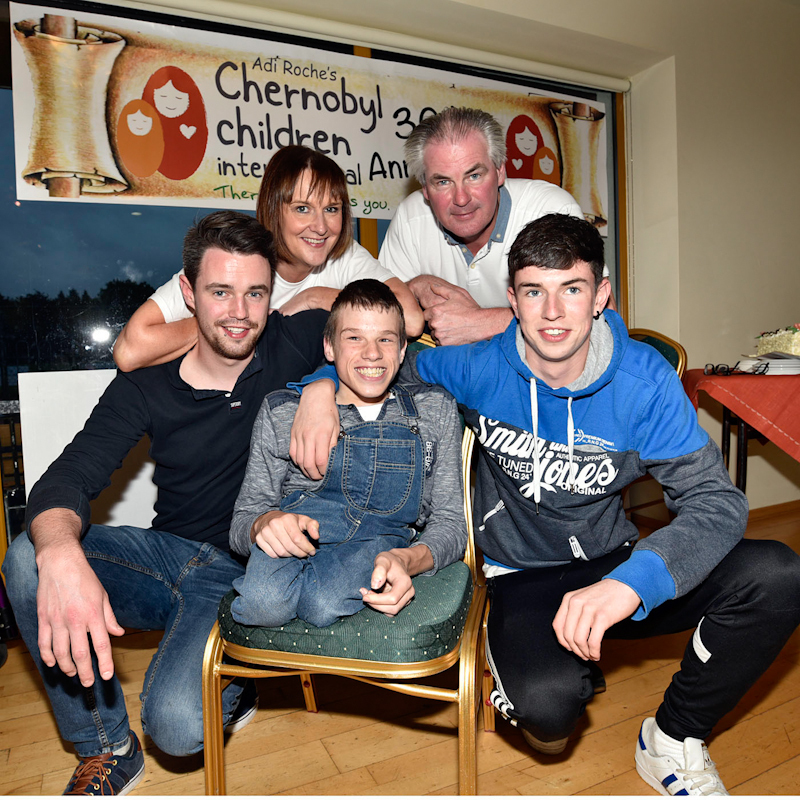 Chernobyl Children Castlebar Outreach group celebrations were held in Castlebar Tennis Club to mark the 30th anniversary, a group of teenagers from Belarus orphanage were the special guests on the evening, host family Marie, Dermot, Darragh and Lorcan Cox pictured with Igor . Photo © Ken Wright Photography 2016. 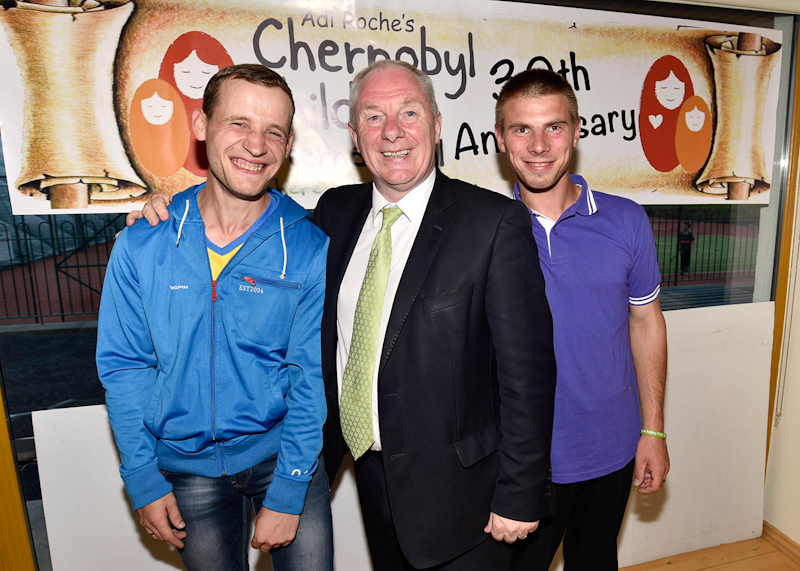 Chernobyl Children Castlebar Outreach group celebrations were held in Castlebar Tennis Club to mark the 30th anniversary, a group of teenagers from Belarus orphanage were the special guests on the evening along with past and present host families, Minister of State for Regional Economic Development Michael Ring TD pictured with two of the teenagers Slava and Micha. Photo © Ken Wright Photography 2016.